Amita Mehta is a trailblazer who is embracing her past, her Indian heritage, lesbian identity and redefining her future. Mehta’s personal journey brought her from Africa to Europe and finally to the United States. As an immigrant, she put herself through college, climbed the corporate ladder from Lancaster, PA to Wall Street. 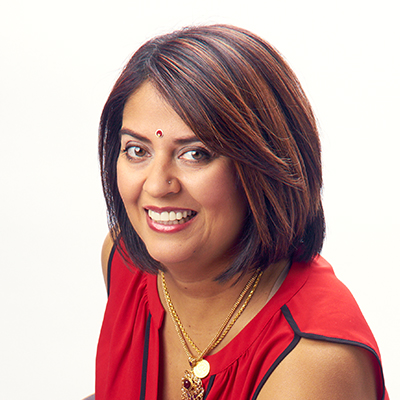 Professionally and personally, Mehta has learned that navigating her own distinctive path is her biggest asset and that assisting others to do the same is her passion. Unscripted and relevant, Mehta advocates for inspiring leaders, cultural diversity, LGBTQ rights, self-discovery, and authenticity. She provides insight on how to build a diverse workforce with an inclusive climate, leadership, individuality and how to embrace your heritage. Through vulnerability and candor, Mehta shares her experiences of family separation, living in a refugee camp, working in the male-dominated field of finance, and coming out as a lesbian to her Indian parents. Mehta currently serves on the President’s Leadership Council at her alma mater, Elizabethtown College and has partnered with organizations including the Jasmyn Center, which works to create safer communities for LGBTQ youth, Working Mother Media, and the Church World Service. Diversity is a key driver of innovation and is a critical component of being successful on a global scale. Senior executives are recognizing that a diverse set of experiences, perspectives, and backgrounds are crucial to innovation and the development of new ideas. In this session, Amita will show data and statistics around why executive leaders need to embrace the power of differences in order to establish a culture in which all employees feel welcome to contribute ideas. She discusses how diversity can be the human resource that sets you apart from the competition, allows you to be more creative and more dynamic. Check out the incredible speaker line-up to see who will be joining Amita.